Travel eight miles northeast from the downtown Los Angeles civic center and you will enter Alhambra, California—a city nestled in the western portion of the San Gabriel Valley. 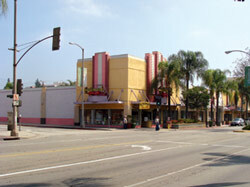 Like many parts of the Los Angeles area, sections of Alhambra have fallen into disrepair. Rather than allowing urban blight to inhibit local businesses and increase crime, Alhambra's city leaders have launched an aggressive plan to redevelop the downtown area. Chris Paulson (MPP '09) is a member of the team leading this charge. Born and raised in Alhambra, Paulson began working for the city as an intern while at the Pepperdine School of Public Policy, then stayed on after graduation until an administrative analyst position opened. During the past two years with the city, Paulson has worked for "visionary" city manager Julio Fuentes. Fuentes firmly believes that people respond to what they see—that well-maintained buildings, potted plants, and paved roads have a positive effect on people's daily lives. With support and guidance from the city council, Fuentes and his team envisioned a beautification project to breathe new life into the downtown community of Alhambra. 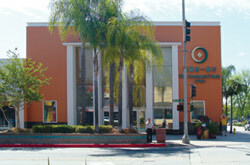 Equipped with more than $100,000 in funding derived from property taxes, the Alhambra Redevelopment Agency got to work. 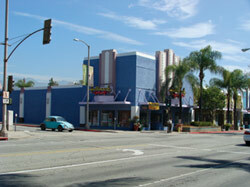 Paulson began by leading a project to repaint business exteriors. They hired an architect to plan a uniform color palette for the buildings and contractors to undertake the improvements. They painted more than 50 businesses in 20 buildings, and the public reception was outstanding. Business owners were appreciative, with some, particularly restaurants, noting that their revenue increased. Other businesses asked when they were next. "Civic pride is one of the greatest things you can instill in people," says Paulson. "With the right amount of civic pride you can basically eliminate crime. No one wants to litter, or graffiti, or break a car window, if they care about the community they live in. Especially in this economy, it's so important to have the community see the city spend the money to make it better." The next phase of the painting project spanned February to March of this year. With more than $150,000, they painted another 55 businesses in 20 buildings. 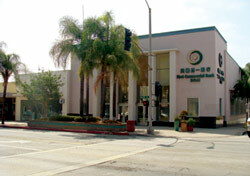 In total the city has rejuvenated 105 businesses in 40 buildings spanning nine blocks of downtown Alhambra. The successful painting project is just one part of the city's multistage campaign to revive the downtown area. To soften the harsh exterior of commercial areas, Paulson used $25,000 that the redevelopment agency authorized to line the same nine-block stretch with 113 potted plants. The response again was immediate and positive. Other projects include a postcard campaign advertising local businesses and discounts, and $100,000 for entertainment in the town center on weekend evenings. With the new, lively ambience set by performers on street corners, residents of Alhambra now spend more time and money downtown. "It's even more special for me to do things that are fun and beneficial to the city I am from and still live in," Paulson remarks. "I get to experience the transformation, see things changing every day. The local level is where you see what you're doing make a difference." This year the city also revived a program from the 1980s called "Alhambra Beautiful," which awards and celebrates attractive residences, providing incentive for homeowners to take care of their properties. The city named 10 "Alhambra Beautiful Homes" and next year will expand the program to businesses and multifamily dwellings. "We're doing everything we can to promote our city," says Paulson, who notes that Alhambra business hasn't slowed in this economy. "If people see the city doing something to benefit them, they respond positively. There's no limit to what you can do when people care about their community."